Coe Press Equipment has announced the availability of its precision coil-processing lines optimized for fineblanking applications. The systems rely on Coe’s HD straightener that can address coil set and crossbow issues necessary to achieve the flatness required for producing near-net-shape blanked parts. As compared to other straighteners, the fineblanking edition provides increased roll-force delivery, stronger gears and bearings, and an improved straightener-roller backup mechanism for increased rigidity. 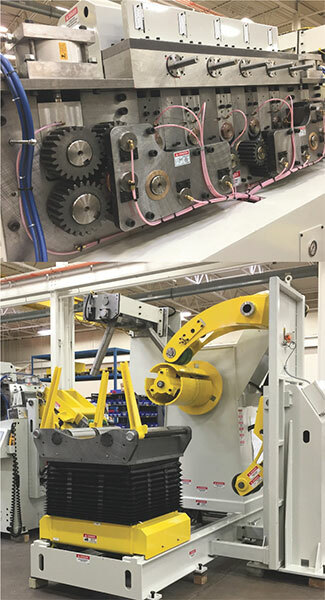 “The precision we’ve built into our straightening heads enables us to offer feed lines capable of achieving the flatness and tight tolerances required for fineblanking, helping deliver specialized stampings with high dimensional accuracy,” says Steve Donnay, Coe director of sales and marketing. Fineblanked parts often are produced from thick and high-strength material, which can prove dangerous as well as challenging to handle manually. To address safety concerns, Coe’s fineblanking lines feature coil reels with multiple hydraulic holddowns with motorized endwheels, for effective coil containment. The mandrel and motorized endwheels rotate in unison for effective threading and rewinding. Additionally, Coe’s pivoting alligator-style peeler-debender offers a hands-free, modular approach to threading. These fineblanking lines can process coil widths from 1 to 36 in., of material as thick as 1⁄2 in. and coil weights to 40,000 lb. Maximum material yield strength: 1000 MPa.